Have you always wanted to learn how to paint? This class covers the basics from value sketch, color mixing (making all the colors in the color wheel from the primaries), brushwork and applying paint to canvas, and techniques for blending and creating beautiful paintings from photos. Beach scene photos supplied, materials list or pay materials fee and have your materials supplied for each class. Acrylic or oils: Titanium white, alizarin crimson, cadmium red medium, hansa yellow, cad. Yellow med., ultramarine blue, cerulean blue, black. Shawn Dell Joyce is the founder and former executive director of a nonprofit plein air school in NY called Wallkill River School. She teaches workshops in pastel and plein air techniques across the country, and is endorsed by Ampersand Pastelbords who supply materials for her demos and workshops. 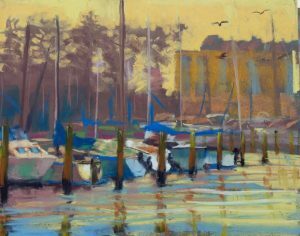 In 2017, she was hired by UArt to do a plein air pastel workshop. She has also worked the plein air event circuit and participated in many prestigious events around the country, bringing home awards for her loose and colorful paintings. She recently placed 1st in the 2018 Inverness Plein Air Festival, 1st in the Quickdraw at Lightchasers in Sarasota, and 3rd in the Hudson Valley Plein Air Festival. She is a signature member of New York Plein Air Painters (NYPAP), and International Plein Air Painters (IPAP), and has been featured in many national newspapers and magazines like the New York Times and Plein Air Magazine. She has participated in many national exhibits and plein air festivals and is represented by galleries in NY and Florida.